Abelias (Abelia spp.) are shrubs in the honeysuckle family that thrive in warm climates with little care. They are known for their long summer bloom period, attractive foliage, and fragrant flowers that are a favorite of butterflies. Abelias are hardy in USDA zones 6-10 and vary in height from 18 inches to eight feet depending on the variety. Their 1/2 to one-inch tubular pinkish-white flowers appear in early summer and often last well into autumn. Though the flowers are small they are massed together in clusters several inches long at the end of gracefully arching branches for a dramatic effect. The foliage is comprised of one-inch oval leaves that turn a burnt red color in fall. Abelias are considered semi-deciduous: in the colder end of their range, most of the leaves drop in winter, but in warmer climates they retain their colorful fall foliage until fresh green growth emerges in spring. 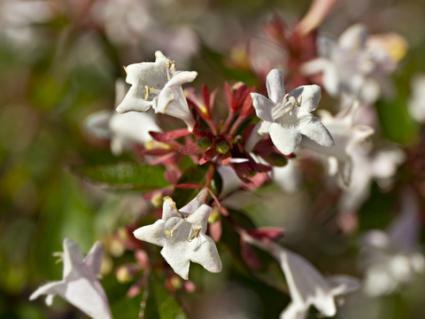 Abelia is easily grown in any type of soil that is not excessively boggy or dry. It grows well in full sun to part shade, though the best flowering is in full sun. 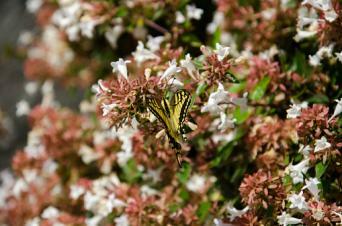 Once established, abelia can withstand short periods of drought, but performs best with a deep soaking every two weeks. Abelias are typically planted three or four feet apart as part of an informal shrub border, whether as a foundation planting, along a property line or to divide different areas of the garden. The smaller varieties are also effective when used sporadically within beds of perennials. Abelias are very common in retail nurseries across the country and are typically planted in spring or fall as transplants. The arching shape of abelia branches is one of their best traits, so it is better to maintain their natural shape rather than prune them into a formal hedge. Prune off dead flowerstalks throughout the summer to encourage repeat blooming. At the end of the growing season they can be pruned more severely to control size if necessary. Thinning out the older branches in the middle and maintaining an open, uncluttered form brings out the best appearance in abelias. 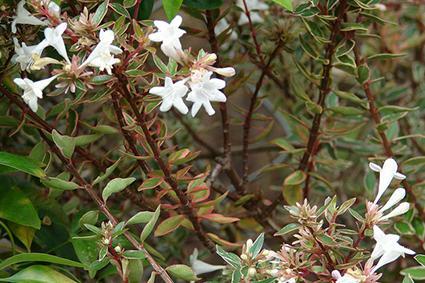 Abelia is free of any serious pests or diseases, though aphids and powdery mildew are ocassionally a minor problem. There are many varieties of abelia available in nurseries, including several with spectacular colored foliage. 'Mardi Gras' has triple variegated white-pink-green foliage and grows two to three feet tall and four to five feet wide. 'Kaliedoscope' has yellow, red and green variegation and grows about two feet tall and three feet wide. 'Edward Goucher' is one of the classic abelia varieties, growing five feet tall and wide with dark pink flowers. 'Prostrata' is a low-growing white-flowered form that grows just 18 inches tall. Abelias have the reputation as an old-fsahioned garden plant that has never gone out of style. It is a true horticulural classic: very easy to grow and visually striking throughout the year.